Today is International Women's Day, a day to celebrate the many social, economic, cultural and political achievements of women. But how do we keep the momentum going beyond today, and bring about real change in the way women work, are hired and progress in their careers? A new report explores just that question. 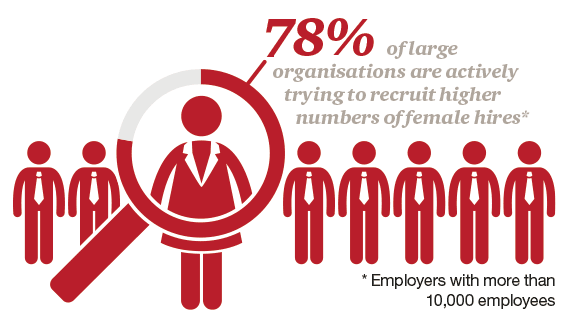 Winning the Fight for Talent examines gender-inclusive recruitment around the world. From rapid technological advances to demographic shifts, megatrends around the world are driving a greater urgency into reassessing existing recruitment practices. Organizations need to be more innovative, they need to be stronger magnets for the right leaders, and they need to build brands and cultures that are inclusive and engage with consumers and stakeholders. With so many demands on performance, the key to success is embedded in talent – and when you aren't considering half the population, you are missing an immense pool of creative minds. This is the reason why 78% of large organizations are actively searching for more women, especially in senior roles. While this bodes well for global gender parity, there is much progress still to be made. 1. Focus on career progression. Women today expect more from their careers than any previous generation. Among the women we surveyed, female millennials (born 1980-1995) and women just starting out in their careers said career advancement was the most attractive trait in an employer. The least attractive was lack of opportunities. Most experienced female professionals who had recently changed employers cited that as the top reason they left their jobs. Companies that establish formal career progression plans will have better luck at attracting employees and keeping them motivated and committed. 2. Revisit people policies. All companies could benefit from taking a hard look at their policies and assessing which ones meet the needs of female employees. These could include leadership opportunities, professional development, global mobility, flexibility and career progression. Proactive organizations will make sure programmes are updated and new ones put into place. There are many of them: 28% of employers have already adopted a formal returner programme, and a further 25% are currently exploring this opportunity. Among professional women on career breaks, 76% want to return to work – yet three-fifths of highly skilled and qualified women who return to work end up in lower-skilled (and, as a result, lower-paid) jobs. Career returner programmes are one way of eliminating this bias against a candidate's career gap, as is an employer's ability to recognize the skills, experience and potential of women who have taken time away from work. 3. Mindset matters. A lot. Globally, 30% of women said that employers do too little to treat women equally in the workplace. In a survey of professional women, more than one in five women reported personal experience of gender discrimination when applying or interviewing for a job. There are three popular diversity recruitment practices that can help organizations: 1) Ensure that interviewers, including interview panels, are diverse, 2) Train recruitment professionals to focus on more inclusive strategies, and 3) Review role descriptions to ensure use of inclusive language. Additionally, the global study suggested that there is a significant disconnect between the views of women and employers on the barriers to hiring more women. Of the top five barriers identified by employers, four explicitly point to external factors, such as the lack of a sufficient candidate pool and the industry sector being viewed as unattractive by women. In contrast, of the top five barriers identified by women, four explicitly point to internal systemic challenges, such as the impact of gender stereotypes on the recruitment process and concerns over the cost and consequences of maternity leave. Organizations around the world should keep an eye on internal (e.g. diverse decision-making groups) and external (clear articulation of values) to bridge this gap. 4. Diversity should be baked in and shared. The good news is that 76% of employers have incorporated diversity and inclusion in their employer brands. Among companies with more than 10,000 employees, 88% report having done so. But talking about diversity is no longer enough. Demonstrable progress – such as an inclusive workplace culture and high levels of collaboration, feedback and care – is increasingly important to women when deciding where to work. Over half of the women (56%) who took part in our global study said they looked to see if an organization had made progress in that department when deciding whether to work there. And 61% of them reported looking at the diversity of an employer’s leadership team as well. 5. Last but not least, lead by example. Of all the women we surveyed, 67% said they considered positive role models when deciding to accept a position with an employer, rising to 76% for women at the start of their careers. Leaders have a vital role to play, by creating the right tone at the top, inspiring other women and helping them to reach their full potential. A diversified leadership team is important, as is an inclusive workplace culture that brings everyone to the table. This means that conversations about inclusion should be carried out by men as well as women, and all senior employees should be strongly encouraged to mentor and build trusting relationships with people who don’t look like them. This is a key goal of the United Nation's HeForShe movement , which aims to mobilize one billion men and boys in support of global gender equality. Find out more about PwC's role as a HeForShe Corporate Impact Champion here . And in this video , PwC Global Chairman Bob Moritz shares what being a HeForShe Impact Champion means to him. Follow @sharmilaakarve a nd @bob_moritz to keep in touch and share your thoughts.